Before you had to go out into the middle of the forest, late on a good hazy night with a beautiful full moon, and just so happen to live through a werewolf attack in order to pull off an authentic werewolf look. Lets face it, some of those generic werewolf costumes basically look like lumberjacks with a bad case of hypertrichosis (hyper hair growth...pretty much). The costumes are just missing something and that something just happens to be the face of a werewolf! You can't just put on a suit full of hair and run around with your god given face, its just not right. So that is why we introduce to you our magical facial reconfiguration potion, you ladies may also know it as 'makeup'. 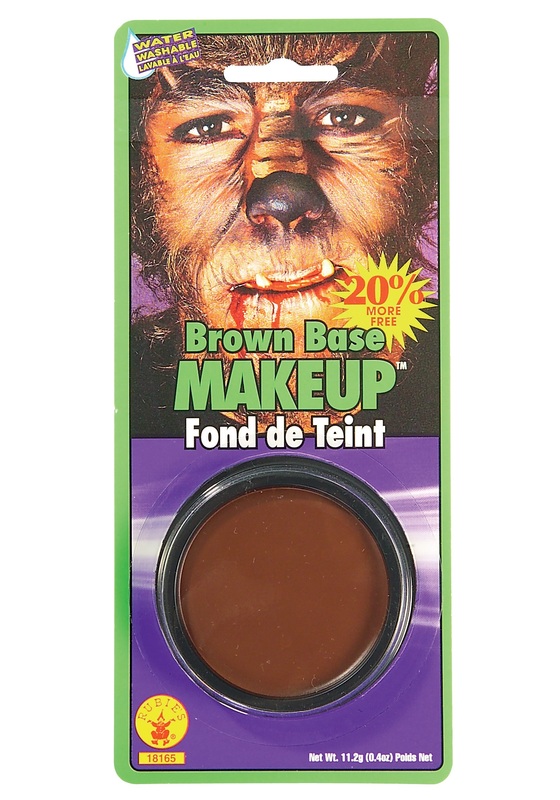 This specific kind of makeup is a brown base and with it and bit of an artistic touch you can transform that ugly mug of yours into the beautiful face of werewolf! Heck, you can even use this face paint to make your dog, cat, mouse...just about any animal costume, really, look more authentic. Not that we recommend it, but you could maybe even save a trip to the tanning salon and convince your friends your sun-kissed skin just comes naturally!